Bring a young professional to an AIST event and get rewarded.►Learn How! 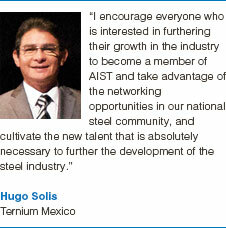 More than 17,500 iron and steel industry professionals make up the Association for Iron & Steel Technology (AIST)’s global network. AIST is a non-profit entity faced with advancing the technical development, production, processing and application of iron and steel. Our individual-based technical association will broaden your knowledge, provide you with countless networking opportunities, and keep you inspired on your path to furthering your career.